The bill comes in the wake of a bungled Republican caucus process that drew national attention and angered party members, especially in Senate President Kevin Raye's home district of Washington County. 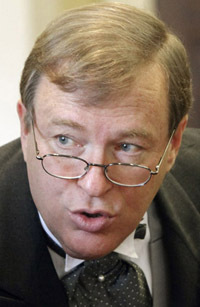 AUGUSTA — Senate President Kevin Raye, R-Perry, has proposed a change in state law to hold presidential primary elections instead of caucuses. The bill comes in the wake of a bungled Republican caucus process that drew national attention and angered party members, especially in Raye’s home district of Washington County. Maine’s Republican Party declared Mitt Romney the winner of the preferential poll held at local caucuses last month, but conducted a recount after party members in Washington County complained they were excluded because of snowstorm that delayed their caucus. Other parts of the state also were mistakenly left out of the count, and some of the local results were incorrectly entered in the official tally. Romney was still the winner, in the end, although the problems led Ron Paul supporters and conservatives to accuse party leaders of manipulating the results. Raye’s bill calls for a more traditional primary election, with voting booths and ballot counting machines, in contested presidential primaries. Delegates to the national conventions for each party would be allocated in proportion to the votes during the primary. Maine’s Legislature has discussed holding presidential primaries in the past, and switched briefly from the caucuses system years ago. The biggest obstacle in the past however, has been the added cost to the state of holding a statewide election. The caucuses process is entirely paid for by the parties. Raye’s bill does not address the cost of the change.